DETROIT (Bloomberg) -- General Motors Co. was given the same credit rating by Moody’s Investors Service as Ford Motor Co., citing the largest U.S. automaker’s low costs and position in the global vehicle market. GM was rated Ba2, the second level below investment grade, with a stable outlook, New York-based Moody’s said today in a statement. The firm rates an anticipated GM secured credit facility as Baa3, the lowest investment-grade level. GM hasn’t publicly disclosed the facility’s terms. “GM has the potential to become a more formidable player in the global automotive arena,” J. Bruce Clark, a Moody’s senior vice president, wrote today in the statement. Clark cited GM’s position in North America, Asia and Latin America, and said GM would have “one of the more balanced global footprints in the industry” if it fixes the unprofitable European business. Moody’s raised Ford’s rating by two levels to Ba2 on Oct. 8, saying the automaker’s operating performance “significantly exceeded” expectations. The upgrade to Ford’s corporate family rating was the fifth by Moody’s in 13 months. GM, 61 percent owned by the U.S. Treasury Department, needs to trim its $26 billion unfunded pension liability to "contend with the industry’s ongoing cyclicality," Clark wrote today. The company’s restructuring of its European operations will take “at least another year,” Moody’s said. Standard & Poor’s gave GM a BB- rating on Oct. 7, one level higher than Ford’s B+, because of its improved balance sheet and prospects for generating cash from operations in markets such as China and Brazil. GM lowered its funded debt to about $8 billion from about $50 billion as part of its bankruptcy last year, Moody’s said today. The company is planning an initial public offering to reduce government stakes. 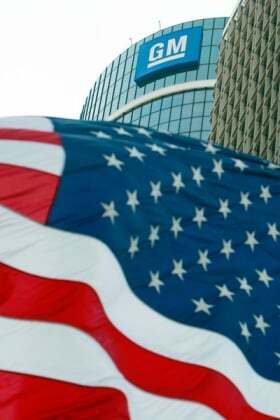 Fitch Ratings gave GM a BB- rating on Oct. 6, the same as Ford’s. GM and the U.S. Treasury aim to hold an $8 billion to $10 billion IPO in November, two people familiar with the plans said last month.